It was just after Michael Harding’s talk at our flagship store late last year, when Cass Art had the pleasure of meeting Mia. After completing her studies in Fine Art in Argentina, Maria Ines Aguirre now exhibits across the globe like there’s no tomorrow! With a roster of many one man shows and collective shows, Mia's resume is as rich and colourful as the work she creates! Much of her work is in oil paints Michael Harding’s range as you might guess!) 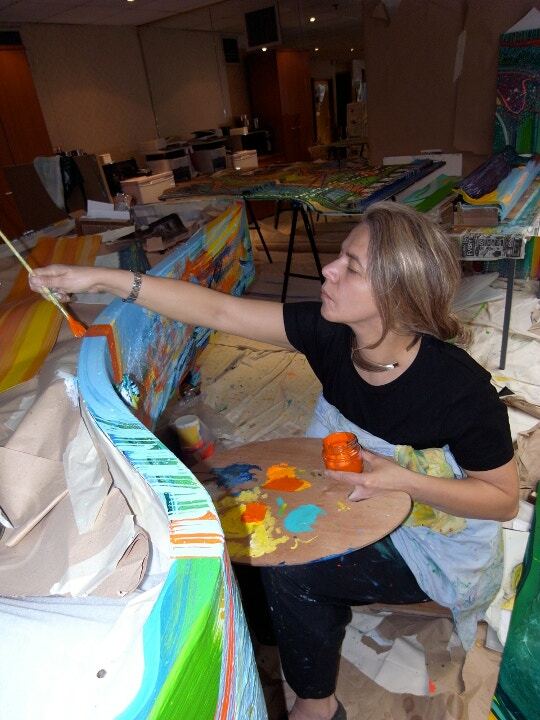 on canvas, although she also works in ceramics and has painted a number of large three-dimensional objects, including two life-size baby elephants and a crocodile which were exhibited in London, Copenhagen, Milan and Edinburgh and later sold at Sotheby’s and Christie’s. 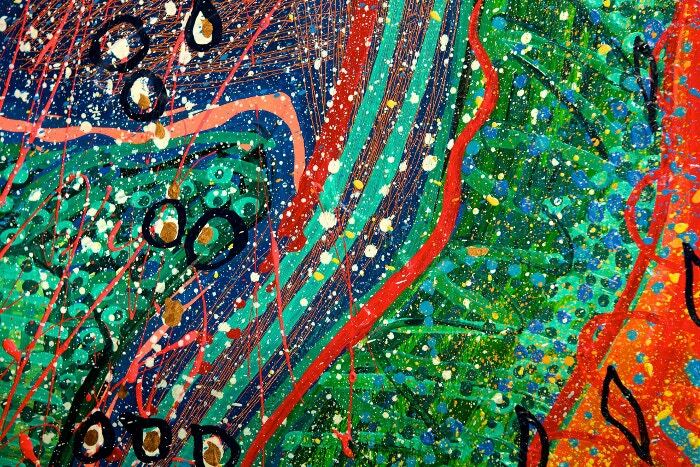 Mia’s piece ‘Dancing Soul’ is a magnificent Steinway Model D concert grand piano that she painted as if it were a 3D canvas, creating a beautifully fluid and colourful abstract surface. Eye-catching is an understatement. Between the passion of the performer, the gravity of the music and the brilliance of the piano, ‘Dancing Soul’ comes close to the German concept of gesampkunstwerk: a work of art that combines different arts - in this case music and painting - and reflects the essence of both. 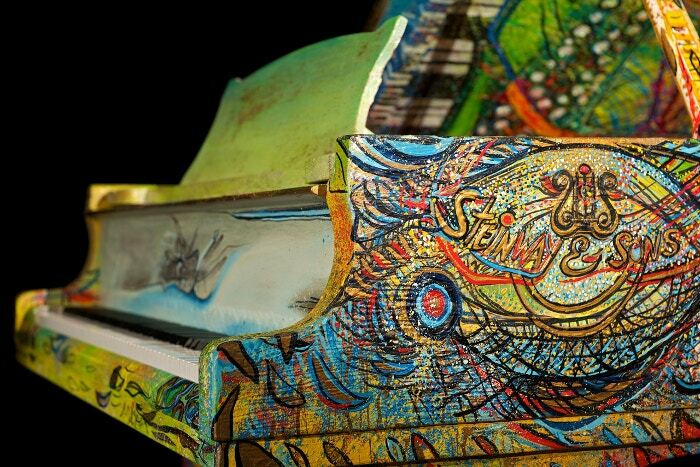 Where did the inspiration to paint the Steinway piano come from? Has it always been an idea of yours? I wanted to combine the sculptural form of a piano with the essence of the music played on it. The only condition was that the piano must be painted at Steinway Hall without a single drop of paint hitting the soundboard. Steinway then turned part of their show room into a studio and, drawing inspiration from Diaghilev and the Ballets Russes, I worked on the piano for seven months - and called it ‘Dancing Soul'. How did you go about starting it? What was the first brushstroke like? I started to paint the piano in 2010, after getting the green light from Glenn Gough, who was then MD of Steinway in London. He gave me complete creative freedom. The first days at Steinway Hall were unforgettable. There was so much energy and support from everyone there. Painting a piano in public view is not easy, but is only possible when you are creating something with complete creative freedom. I always saw the piano as a large canvas with sounds. I felt like a painter-pianist composing their music with colours, for almost seven months. From the very beginning, the creation and application of paint each day was something new and also the relationships made with musicians and unlikely people who looked at me through the window made everything much more exciting. I used to say that I was in 'Planet Piano' - and that's exactly how it was! My first brush strokes were turquoise - like the water of a beautiful sea or the sound of wonderful music! Later the yellow-sun came along, filling the whole piano with a spirit of happiness and without realising it; the piano became flooded with magic colours - which for me are always made by Michael Harding. 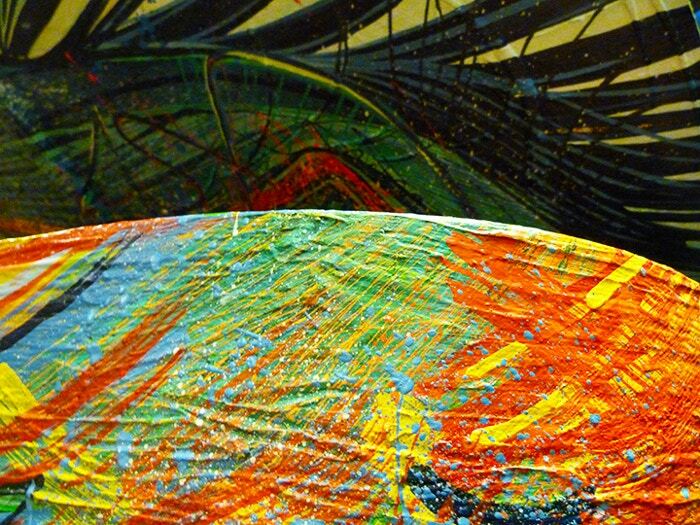 He makes colours that have sounds - and a Steinway makes sounds which create colours. I remember that I started with the sea, which covers the lower part of the piano while the brush strokes above are waves which are also a homage the feathers and extravagance of les Ballets Russes - with highlights as emotions inspired by an angel. I am a frequent pilgrim to Cass Art. My favourite materials are Michael Harding's oil paints. They are unique. The colours and intensity of pigment and the flow on the brush are incredible and I can't now work with any other oils. I also do a lot of pastel and love working with soft pastel, usually Sennelier as I know exactly how they feel and combine. Then I always need brushes, palettes and paper - I love using 360gm Sennelier pastel paper! What is your process like? What music did you listen to? My process is completely natural and spontaneous. It is therefore full of accidents and these accidents pave the way for what I am painting. It's the art of creating art while brush strokes appear - my work has to be spontaneous. In the case of the piano, I also had to think how to paint it in a space that was crammed with other, untouchable, pianos! It wasn't easy, but it was as if the other pianos knew that Dancing Soul was arriving, because in a magical way, I found I mysteriously had more space - and ideas - so I could continue with creating my piano. Somehow the other pianos made more space - invisibly!!! I called it the 'piano tortilla' because I first had to paint one side of the lid, for example, which is almost 8 feet long, and then the other. Oil paint takes time to dry, so it was hard. When Michael Harding came to see how I was getting on, he told me it would take 400 years before the paint was chemically dry - so, I hope the piano will last as long as the music that is played on it!! All the parts of a piano have to come together precisely, and like music itself, the elements that make up the painted piano came together so the painted sounds and colours work together simultaneously. As for the music I listened to while painting the piano; the music of the different pianists who came to Steinway was always in the air, so a lot of Chopin and also Stravinsky. I also remember hearing the Alhambra Suite, a wonderful piece by the Spanish composer and pianist Juan Gallego-Coin. There was also a lot of silence - when I'm painting I actually need a lot of silence and that's why my last show in Spain was called 'El Color del Silencio'. However, whenever a tuner appeared to work on one of the pianos nearby, I had to stop painting and would retreat under the piano where I would lie down and dream until they had finished... but these moments were very creative because they made me look and think about what I was doing with each part of the piano. Who were the musicians that played it? What was it like seeing them utilise your work? It was wonderful to see five brilliant pianists playing Dancing Soul when they were filmed at Kings Place. It brought visual art and music together in a unique way - a real symphony of arts, united by the force of the spirit of colour and imagination. Alexandra Silocea played Prokofiev's 3rd Piano Sonata, Charles Owen played the duet version of Stravinsky’s Rite of Spring with his playing partner Katya Apekisheva, Juan Gallego-Coin played his Alhambra Suite and Julian Joseph played his version of 'See These Hands'. What’s coming up in the future? Will there be more music related creations? I am intoxicated by new ideas.... by the romance of creating something really unusual... I cannot ask myself what is coming next: one work of art brings something to think about while creating a new work.... The best way to create a future is to create it! Now! In March this year I am having a show in Granada, Spain. The name of the show is 'Camino de Luz' and it follows my travelling shows in Andalucía in 2011-12 and a show in Argentina. Ever since I was born, for me each sound has a colour. It will be great to do more work in relation to music. In 2013 I painted the set for a production of Carmen at Woodhouse Opera - and I love painting murals and set designs - they're a unique experience. I am currently working on pieces inspired by the music of Olivier Messaien, which is so special, working with a wonderful young Indonesian pianist at the Royal College of Music. I am also creating a piece for a commission about Stravinsky. To take a look for yourself, the Steinway Hall is located just north of Bond Street, more visiting information on their website. You can contact Mia and have a browse of her pieces on her website and follow her for updates on her Twitter. Feeling inspired? Head to our online shop at www.cassart.co.uk to stock up on your supplies to create something just as amazing as Mia’s Dancing Soul. Share your work with us on our Facebook and Twitter.